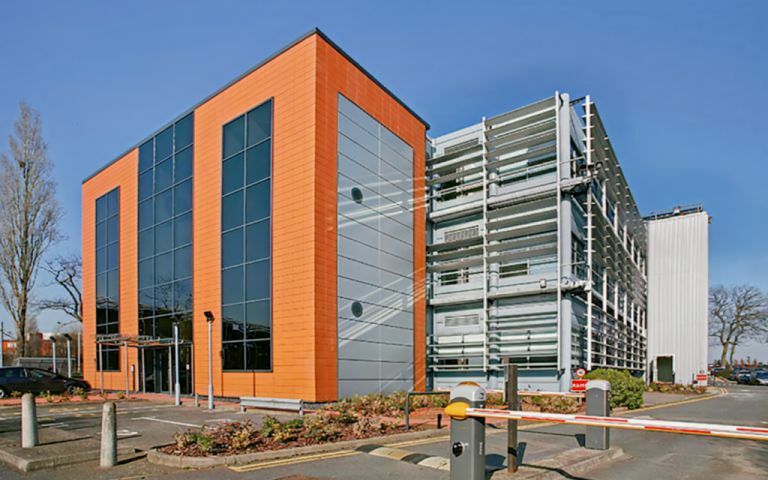 A polished contemporary business centre comprised of glass and terracotta blocks; this serviced office space on Bessemer Road, Welwyn Garden City, overlooks a spacious internal atrium with an abundance of natural light. Decked out in state-of-the-art monochrome furnishings, this corporate property boasts creative communal areas, including a vibrant on-site coffee shop, as well as quick access to mainline national rail services towards London. Facilities at this serviced office include; dedicated car parking; on-site coffee shop; air conditioning; alarmed or manned security; breakout and reception areas; personalised telephone answering; digital telephone system; site and building maintenance; kitchen and catering facilities; on-site management and staff; manned reception; virtual office services; 24 hour access and a comprehensive IT and communications network. The centre is just a short walk from Welwyn Garden City train station, which provides national rail services towards Londonï¿½s Moorgate and Kingï¿½s Cross St. Pancras stations, as well as Stevenage and Peterborough to the north. The property also boasts extensive road connections, with the A1 ï¿½ just five minutes away ï¿½ offering quick access to the M25, only half an hour away. Alternatively, the site is serviced by a number of bus and cycle routes. These offices in Bessemer Road offer a range of prices depending upon your exact requirements. Contact us now and we will help find the best price for you, based on your individual needs.